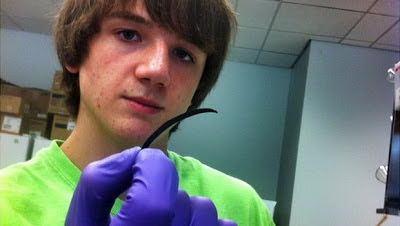 Jack Andraka is a fifteen year old freshman in high school. He developed a paper sensor that could detect pancreatic, ovarian and lung cancer in five minutes for as little as 3 cents. He conducted his research at John Hopkins University. This research could change the face of cancer and promote early detection. To think that scientists spending millions of dollars to find more about cancer, a 15 year old finds out by doing a science fair project! Jack's method is 168 times faster, 26000 times cheaper, 400 times more sensitive and has a 90% success rate. He has been selected as the Intel 2012 ISEF winner and has won awards at multiple national and international math competitions. Jack is on the national junior whitewater kayaking team and enjoys playing with his dog and folding origami. The government and major corporations don't like competition. But unfortunately for them, the next generation does!